Life’s lessons can often be learned more effectively outside of the classroom. I firmly believe that most of what I know was learned outside of school. 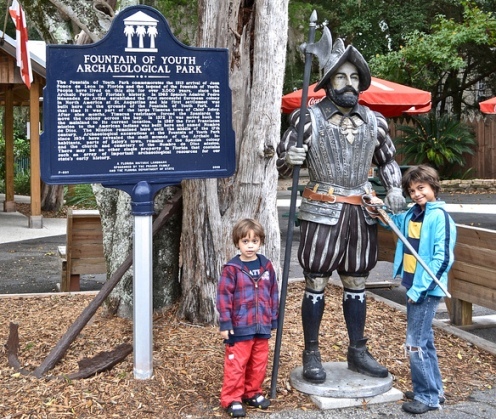 However, there was one thing I heard about in school that got stuck in my mind: Ponce de Leon Fountain of Youth. As the years passed, I remembered a few things about its history – but its location escaped me! When I started doing research for a visit to St. Augustine I discovered that it was the location of the fountain of youth. I couldn’t believe it! I had secretly wanted to visit this place since I was a teenager, and now I was going to be able to do it. 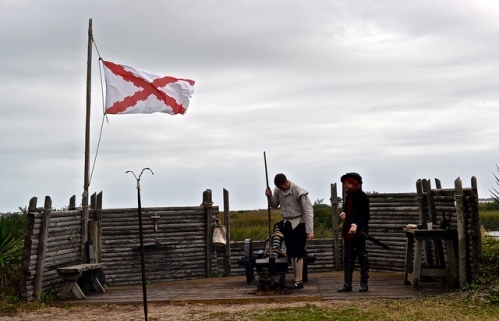 The park is now a Florida Historic Landmark and a living museums where visitors can see re-enactments and exhibits that take you back in time to the days of Ponce De Leon and the first settlement of St. Augustine. But first, let’s have some fun learning history. 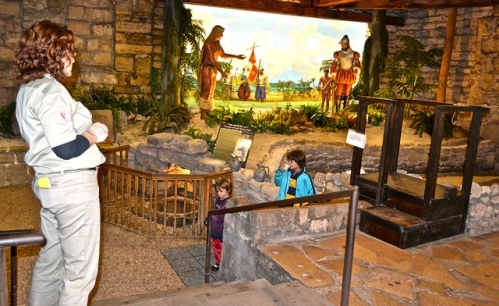 The park is located on the original 1565 Site of St. Augustine. There is proof that this archaeological park has been used as a tourist attraction in St. Augustine since 1860s. However, the modern attraction was created by Luella Day McConnell in 1904. It is said that Luella Day McConnell purchased the Park using diamonds, so she became known as “Diamond Lil”. However, there is no proof of that. The first archaeological excavations at the Fountain of Youth took place in 1934 and were performed by the Smithsonian Institution. The digs produced a large number Christianized Timucua burials. These burials eventually pointed to the park as the location of the first Christian Mission in the United States. Decades of digging confirmed that the park is the exact location of the Pedro Menendez de Aviles’ 1565 settlement. The park grew from that point and now features real historic sites as well as some classic tourist spots that include the spring. There is an enclosed spring within the park. 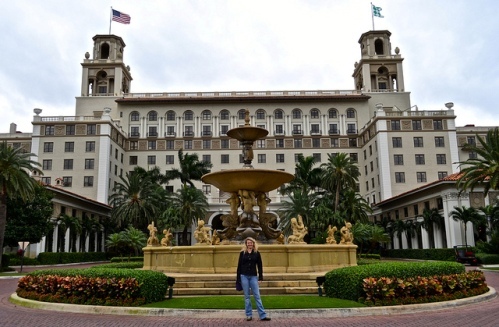 It is believed that it is the Fountain of Youth that Ponce de Leon was looking for. Juan Ponce de León was a Spanish explorer, and the first to explore Florida. He was already and experienced warrior by the age of 18. In 1493 he became part of the crew for Christopher Columbus’s second voyage. By the early 1500s he had already been appointed as frontier governor of the Higüey province in La Española. In 1509 the king of Spain was grateful for his loyalty and appointed him Governor of San Juan Bautista (Puerto Rico). Rumors of undiscovered islands to the northwest of Hispaniola had reached Spain by 1511. By February 1513 Ponce de Leon was on his way by orders of the king. One Month later they found land, because of its colorful, blooming landscape it was called La Florida which means ‘flowers blooming’. It is believed that this first expedition landed in St. Augustine. Ponce de Leon became the first conqueror to be knighted and given a coat of arms in 1514. In 1521 Ponce de León organized a colonizing expedition on two ships. It consisted of some 200 men, priests, farmers and artisans as well as 50 horses and other domestic animals, and farming implements. There was an attack by the natives where he was injured. He died from it. The Fountain of Youth is a legendary spring that supposedly restores the youth to whoever drinks from its water. The legend became particularly prominent in the 16th century and was attached to Ponce de León. People of that time said that he discovered Florida while searching for the Fountain of Youth. There is a possibility that the Fountain of Youth was an allegory for the Bahamian Love Vine. It has been speculated that Ponce de Leon mistook the natives’ “vid” (vine) for “vida” (life) – transforming their “fountain vine” into an imagined “fountain of life”. The myth started when Spaniards noticed that the Tequesta, natives that lived on these lands, lived well into their 50′s, 60′s and 70′s while the average Spaniard’s life span was no more than early 40′s. When Ponce De Leon arrived and saw this he demanded to know why and the natives said it was their natural springs. The Calusa natives were hunter-gatherers who existed on small game, fish, turtles, alligators, shellfish, and various plants. Apart from the cacique, other strata included priests and warriors. By the time Ponce de Leon arrived on the coast of Florida the Calusa were the largest and most powerful tribe in South Florida. They were able to maintain relations with Spaniards and to resist their colonization attempts for several years. Before the Spaniards got to South Florida tribes often canoed through the Everglades, but rarely lived in them. Canoe trips to Cuba were also common. The Tequesta also inhabited the region. They were Second in power and number to the Calusa. Sailors from Spain feared the Tequesta. This culture was much more hostile, but maintained friendly relations with them for a while. Like the Calusa, the Tequesta hunted small game. They did not practice cultivated agriculture. Out of the parks that we have visited this is one of the most hands-on and interactive. The actors are great and knowledgeable about the history of St. Augustine. The staff is also great when it comes to maintaining kids engaged in the activities. For me this is the best way to learn – by doing things yourself and having fun at it. There is also a canon that used to go off as a warning against enemies of pirates. The coolest part is that is still done every hour on the hour starting at 11am. There is a whole ceremony that ended up being as educational as it is fun and loud. Aside from the re-enactments there is plenty of stuff going on. There are also shows during the day, in different theaters. You will get the schedule as you walk in.